From the pure basic deep knee bend or squat which was covered earlier in this series, there have over the years evolved many fine exercises for shaping the legs and giving that 'finished look' to the physique's lower half. One of these movements might be referred to as an upside down squat because when the mechanics of the working muscles are studied, it is indeed almost a squat performed in the upside down position. I am, of course, talking about the LEG PRESS. Like its big brother the squat, this movement will keep the legs in tension throughout 90% of the complete movement if performed correctly. I believe, however, the majority of people who use this exercise do not utilize it to its fullest extent due simply to incorrect breathing procedure. The movement itself is a simple one. The body position alleviates all possible injury to the back unless one makes the mistake of getting too far under the machine in which case the lower back rises up off the padded board. The exercise affects the whole thigh including the leg biceps and most individuals will find that the calves also help to execute the movement. Most people inhale on the downward movement of the leg press and this, in my opinion, is wrong as one actually works against the outward movement of the chest caused by the expansion of the rib-cage or diaphragm. What we must attempt to do is get into the habit of exhaling as the legs are drawn down towards the chest and inhaling as the greatest effort is being made, that is when the legs are being extended. Please try it this way and I'm sure you will be amazed at the extra movement range that is possible, especially on fellows who possess large chests. One of the most pleasing aspects of the leg press exercise is the fact that almost everyone without exception can work up to some fairly respectable poundages within a short period of time. Also, as I've mentioned, the chances of injury are virtually zero unless, of course, the apparatus is in need of repair or grossly misused. Being used as a leg shaping movement means that faster results will be forthcoming by keeping the repetitions rather high - say 10 to 15 reps per set. Apart from the variances in foot and knee spacing, the basic leg press can be performed two ways and both will give the thighs a terrific workout if enough resistance is used. The first way is to do a full lockout at the completion of each repetition. This means the trainee will actually lock the knees and tense the thighs vigorously at the extended position after each and every rep. The second method shouldn't be attempted by the beginner as it can produce some soreness even for the advanced man. This time instead of making each rep a full one we will do only a partial extension until the desired amount of reps have been completed. In other words, no lockouts or pauses until the full set has been performed. The astute bodybuilder can add variety to his leg pressing by changing not only his foot spacing but by forcing the knees and thighs outward or by bringing them together as close as possible. Try dropping the reps low to about 5 or 6 using all the weight you are able to handle. You can also produce different results by going as high as 30 reps per set with a medium amount of resistance. Combinations of the aforementioned methods and experimenting with the leg press exercise can add a lot in the way of variety to your leg workouts. The leg press has often been called the lazy man's squat and I feel this is most unjust because as a leg builder as well as a shaper, this exercise can stand up as one of the best completely on its own merits. Add to this the fact that there are many men who, due to their body structure, find certain types of squats difficult and uncomfortable to perform. 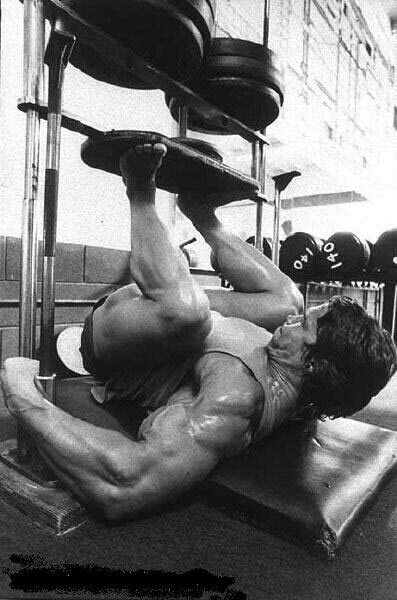 To these people, the leg press can be of major importance. The HACK SQUAT is another variation of the squat that is a perennial favorite of bodybuilders everywhere. The hack squat must be performed correctly to achieve any results in promoting muscular growth of the lower frontal thigh mass just above the knee. It is imperative that the back is kept flat throughout the movement otherwise the exercise just becomes a waste of time and effort. I urge you, therefore, to pay strict attention to the performance of the hack squat adhering to strict form at all times. All of the top bodybuilders use this movement quite extensively in their routines. In fact, this exercise has become so popular over the years that hack squat machines are found to be an integral part of most of the gyms in existence today. These machines ensure that the bodybuilder does the hack squat in good style and a few weeks of specialized leg work will in most cases produce visual improvement in thigh shape and muscularity. The vastus internus in particular is given a very strenuous workout and time spent doing the hack squat in good style will bring out the inner thigh group into prominence. Steve Reeves was a firm believer in the hack squat and used it regularly. 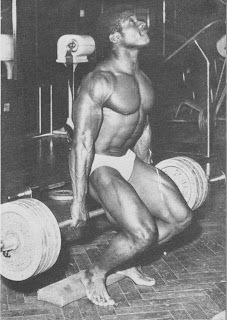 A close study of the Reeves physique will leave no doubt in the mind of the bodybuilder as to the value of the hack squat, as I've been told by people who knew him well that this exercise coupled with the front squat was largely responsible for the fantastic leg size and shape that Reeves developed. Reps and Sets - The hack squat, like most of the squats, can be used to bulk or shape the lower thigh. All one needs to do is increase or decrease the sets and reps and adjust the resistance to suit. As I pointed out earlier, however, strict adherence to good style is of extreme importance and it is for this reason alone I urge the bodybuilder to use the hack machine if he has one at his disposal. To gain size fast, try 4 sets of 6-8 reps using all the weight you are capable of handling. To achieve more hardness in the thighs increase the reps to 12-15 per set. For a more cut look, assuming you are following the proper diet, the trainee may be encouraged to go as high as 30 reps per set. Moving right along now I would like to discuss a shaping exercise which is yet another variation of the squat. It is known as the SISSY SQUAT and it has been very much in vogue for the past 15 years or so, especially here is Southern California. I am not sure of its actual origin but I believe the famous physique star and gym operator Vince Gironda has had much to do with it becoming a more popular movement and he has given it much favorable comment in his writings. 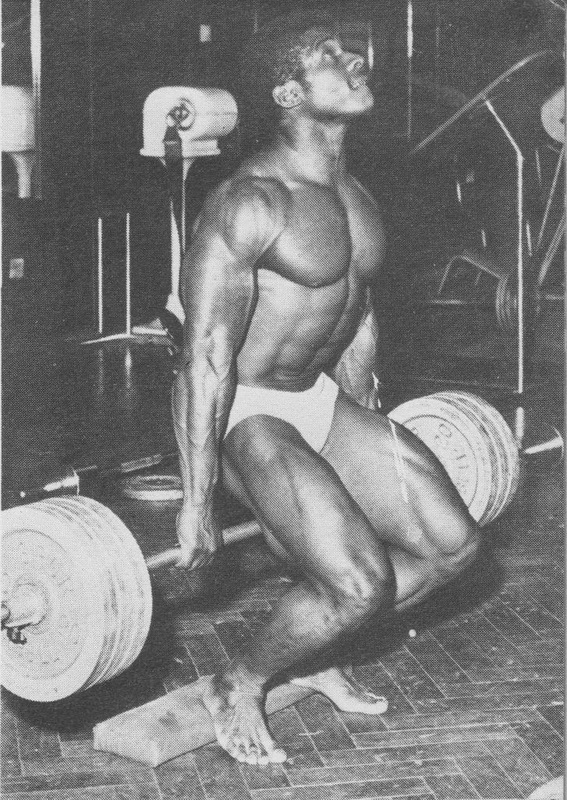 Most of the top-line bodybuilders of today are frequent users of the sissy squat in their routines. The sissy squat may be performed without weights, with the hands held on the hips or with a light poundage held in front about upper chest level. We must never lose sight of the fact that there is a right way and a wrong way of doing things, the right way will give you the maximum results possible while the wrong way can result in no gains at all. With this in mind, I would like to say a picture can be worth a thousand words and this would appear to be doubly true in the case of this exercise. Stand by a post or bar and hold with one hand, place other hand on hip, then lower your self on toes into squat while keeping body strictly erect, thus placing the strain on thighs just above the knees. You will perhaps notice a strong tendency to become unbalanced at first but this will pass as you get used to performing this fine movement. Placing one hand on your hip and holding onto a bar will help you through your first attempts. I am making this exercise sound so difficult you are probably wondering if it will be worth the bother. This is a good time, therefore, to point out that the sissy squat is most definitely not for the beginner. In fact, most intermediate trainees will have no need for this exercise until they are approaching the advanced stage. This is not an exercise designed to give size but rather one that can add that extra "something" in the way of shape and muscularity to a leg that already possesses size and shape. The advanced man in particular should perform this exercise from time to time and in most cases from it will emerge a favorable change in leg shape. Keep the reps fairly high, between 12 and 20 per set. Sissy squats may be performed as a prelude to your regular leg work or immediately following it.